A few years ago, a friend was planning to give a public talk about her experiences at the UN Conference of Parties on Climate Change in Copenhagen. I really wanted to go, but logistics were such that I needed to take my then nine-year-old daughter, Simone, who did not want to sit through another boring lecture. I bribed her by saying she could play games on my iPod. Simone played Angry Birds while I listened to the latest dire predictions of sea level rise, extreme weather events, mass extinctions, widespread droughts, and how some scientists were starting to say it is “game over” for the climate. On our way home, riding a motorbike to where we were living in India at the time, Simone was hugging me from behind and said into my ear, “Daddy…was all that true? What that lady said about floods and disease and storms…is all that really going to happen?” It suddenly hit me that not only had she listened to the talk, but it had sunk in and she was scared. I immediately got a lump in my throat and I thought, “What do I tell her? I don’t want to lie, but I also don’t want to scare her more!” So I took a deep breath and said, “It’s true that because of how humans have treated each other and the planet, the coming decades may be challenging and uncomfortable. But how we respond to these challenges is completely up to us. If we keep being mean and greedy, things will only get worse. But if we learn how to treat each other and our planet with kindness and respect then this could be a turning point and the beginning of a miraculous time in human history. So, while the coming crises may be difficult, they are also opportunities for us humans to finally grow up.” This belief has been the inspiration behind everything I’ve done in my adult life. 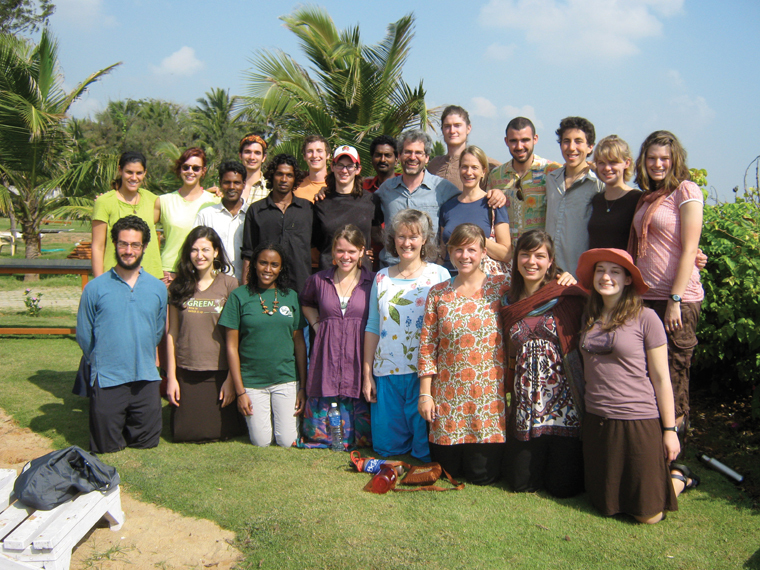 It was also the reason my family was in India as my wife and I were directing a study abroad program in Auroville, a large international ecovillage in south India. It was a real privilege to introduce young adults to this incredible community and witness them wake up to new possibilities for themselves and the planet. The semester program was part of a nonprofit called Living Routes, which I started in 1999. 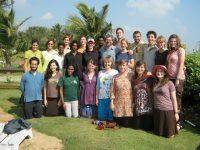 Living Routes partnered with UMass Amherst to take college students to ecovillages around the world. In the end, over 1,500 students went on these programs and most came away inspired to live in greater harmony with each other and the planet. It was wonderful, life-changing work. Here was an organization all about sustainability, but we were also flying students around the world, which was emitting megatons of carbon pollution and contributing to global warming. I felt strongly that we needed to account for these impacts because, fundamentally, we’re facing climate change and other environmental crises precisely because we, as a species, have taken nature for granted and not accounted for our impacts—from depleting our forests and other natural resources to polluting our air and water, etc. Think of it this way. Imagine you are a contestant on The Price Is Right. If Bob Barker asked you the price of a particular car or big screen TV or a transatlantic flight, I bet you could offer a reasonable estimate—and perhaps even win fabulous prizes! But if he asked you how much carbon pollution is emitted by driving that car or watching that TV or flying across the ocean, most of us don’t have a clue. This is because we grew up in cultures that value economics over ecology. So to help our students get a clue and build an awareness and a vocabulary around their environmental impacts, I set up a system where we measured, reduced, and priced the carbon footprints of our travel and created a fund to acknowledge and account for the emissions of each program. The question then became, “What do we do with this money?” It would have been quick and easy to give it to any one of a hundred carbon offsetters such as TerraPass or Native Energy. We could pay a certain amount that they would reinvest into a renewable energy project that would then reduce a certain amount of carbon emissions from entering the atmosphere. They would even give us a nice certificate to say we became Carbon Neutral—and successfully mitigated or neutralized our emissions. To their credit, carbon offsetters have helped a lot of people better understand their emissions and over $3 billion has been transacted to support a lot of good projects around the world. And, so far, offsetting has really been the only game in town for doing something about our unavoidable emissions after we’ve reduced all we can. But there are also a slew of challenges with offsetting. A big one is that because of all the middlemen involved, some estimate as little as 30 cents on a dollar actually makes it to the projects. They’ve also been compared to 16th century indulgences where parishioners could pay the church to absolve them of their sins. Some say offsetting similarly allows people to buy a clean conscience while delaying meaningful action. Another big issue with offsetting is the concept of “additionality.” Imagine you pay me some money to plant some trees and I go ahead and do just that. But then you find out I was going to plant those trees anyway. You might be a little upset because you assumed it was because of your money that the trees were planted. In a similar way, it is very difficult to know when an offsetting project is in fact “additional” and some estimate that as many as 70 percent of projects would have happened anyway, even without offset funding, in which case they’re not really offsetting anything. For these and other reasons I didn’t want to offset to acknowledge the emissions from our flights. But what’s the alternative? After struggling with this question for a number of years, it finally dawned on me. Let’s still measure, reduce, and account for our unavoidable emissions. But rather than try to be carbon neutral, let’s direct funds (and/or our physical labor!) to projects we trust are building sustainability in communities that matter to us. By dropping the controversial and confusing concept of carbon neutrality, we gain a lot of advantages and broaden how we think about and respond to climate change. For example, without having to pay middlemen, we can get a lot more money to the projects themselves. And rather than guilty indulgences, we can be grateful for fossil fuels while also internalizing their costs. And rather than worrying if our money is actually getting to projects, we can support projects we already know and trust are doing good work in the world—small projects, local projects, even non-mitigating projects that could not receive support through offsetting. And it was really this last idea that catalyzed my thinking with regards to Living Routes. Why would we give money to some anonymous project when there were all these great projects right in front of us and aligned with our organizational mission? So this is what Living Routes did in ecovillages around the world: We supported solar cookers in Senegal, electric rickshaws in India, a recycling center in Mexico, a “dome-atory” in Israel, and tree planting wherever we went. The students loved the opportunity to give back to their host communities and the communities appreciated the support. And just to be clear, I absolutely believe we need to reduce our carbon emissions as quickly and as fully as possible. What I’m saying is we need to do that…and…we need to do so much more. We need to create community-based food systems. We need to preserve biodiversity and “wildness.” We need to fight for climate justice and for those unfairly burdened by the consequences of global warming. And we need to deconstruct and replace the economic and political systems, and even the mindsets and worldviews that got us into this situation in the first place. We can’t do any of that through offsetting, but we can through onsetting. In 2016, I worked to onset two FIC and GEN North America (GENNA) meetings. In the spring, we accounted for FIC and GENNA board members’ unavoidable travel to Lost Valley Education and Event Center in Oregon and contributed $600 towards their “Solar Roller,” a mobile, hands-on station that is educating youth across Oregon about renewable energy options. In the fall, we onset meetings at La Cité Ecologiqué and supported their photovoltaic initiatives, but I also ran into two concerns from Board Members around whether this was “carbon reductionism” and how to account for our positive work in the world. I am hoping this article might catalyze a broader dialogue on how communities might best respond to their unavoidable CO2 emissions. Expanding on the first concern, Charles Eisenstein describes “carbon reductionism” as “an intellectual and quantitative understanding of climate change that lends itself to over-simplified solutions, in perpetuation of the same ideological force that generated this crisis to begin with.” Instead, he argues we need to focus on a qualitative valuing of our world and understanding the parts through the whole. I agree our dominant culture favors the quantitative over the qualitative, but rather than swinging to the opposite pole, let’s embrace both! Yes, pricing carbon leaves out a lot of important stuff. I mean, how can we even begin to think about the true cost of a species going extinct? But does this mean we shouldn’t even try to understand how our actions will have very real consequences for the lives of our children and all life on the planet? How will we survive as a species if we don’t create economic systems that account for the full cost of goods and services? Let’s start where we can! The second concern is that the FIC, GENNA, and most communitarians are inherently part of the solution and that because of all our good works in the world, one could argue we are already carbon negative. Instead, the thinking goes, let’s focus on getting corporations to account for their emissions and to support community-based projects and organizations that are trying to heal the world. Here is an analogy in response to this concern. Imagine we’re a group of communitarians that decided to eat at one of the pay-what-you-want restaurants that are popping up all over the world. (See www.theguardian.com/travel/2014/jan/28/pay-what-you-want-restaurants-around-world.) At the end of the meal, would we say, “I don’t think we should pay because we grow more food than we can eat in our backyard permaculture gardens”? Yes, it’s great that we’re growing food. And…there is an actual cost to the meal we chose to eat, which we should also acknowledge and account for. We might also say, “Wealthy folks who don’t care about good food should eat here and pay for our meals as well.” The problem is, those folks probably aren’t going to eat at these restaurants in the first place and, even if they do, they might also come up with similar rationales like, “I don’t think I should pay because I already donate thousands of dollars to good causes.” My point is that there are actual costs to our travel emissions that I believe we should account for despite our other good deeds and, also, that it is a slippery slope to rationalize our way out of these costs since everyone can come up with good reasons why they shouldn’t have to pay. What do you think? Does it make sense for visitors to ecovillages and other communities to voluntarily onset their unavoidable emissions and support community-based sustainability projects or is this a reductionist and “old paradigm” endeavor that is at best confusing and at worst hindering our Great Turning towards an ecological age? To join the conversation, go to the comments section below. In 1999, Daniel founded the nonprofit Living Routes, which partnered with UMass-Amherst to run study abroad programs based in ecovillages around the world. Over 1,500 students were transformed by these immersive experiences. Daniel left Living Routes in 2012 to start a new social venture called Earth Deeds (earthdeeds.org), which offers online tools for individuals and groups to “onset” their unavoidable CO2 emissions and support meaningful sustainability projects. Daniel has been a leading advocate for sustainability within international education and the ecovillage movement. He is cofounder and past Board Member of Gaia Education (gaiaeducation.org), and currently serves as President of the Global Ecovillage Network (gen.ecovillage.org). I have never understood carbon offsets. It has always appeared to me to be a way for corporations to continue producing carbon. In reality as long as a company sees the cost of paying for carbon offsets as being less than the cost of the scrubbers or whatever it takes to reduce their carbon footprint there is no incentive for them to change. If they can get money from carbon offsets to build those scrubbers then they win on both sides without having to take any responsibility. The way I see it carbon offsets simply do not work. Carbon offsetting stirs memories of sin penance from my Catholic upbringing, which is actually a positive thing! If the 10 commandments can be compared to climate policies agreed on during the UN Climate Conference, which serve as guiding principles of social progress, the stories of the Good Samaritan may be compared to Earth Deeds. If the offsetting is simply done by paying a tithing to repent for you carbon footprint sin, then you haven’t experienced the gift of a life lesson. If however ones impact is mitigated through community action the single seed sown to make up for a tree lost may germinate an ecosystem of life enriching lessons. I hope to meet you with shovel in hand one day Daniel! Thanks Cassidy. I agree that actually doing something to “atone for our sins” is better than simply buying a clean conscience with indulgences or offsetting. I too hope we will meet someday with shovels in hands! Hi Beth. Thanks for your comment and sorry for my delay in responding. Yes! Not only is offsetting plagued with inefficiencies and other problems, it also limits how we think about and respond to climate change. We need to think systemically and support resilient communities above and beyond “neutralizing” individual emissions. Do you have a sense for why this idea has gotten such little traction within the communities movement? Daniel, I’m shocked you haven’t got any comments yet! Your considerations have been mine for many years–I don’t specially mind if people do carbon offsetting, I mind if they think it matters in the way that economists seem to persuade us they matter. They don’t! They matter in the way you’ve described–they mitigate, indirectly, without affecting emissions directly, and they don’t affect adaptation. Thank you for provoking discourse so intelligently and humbly.